This edition of Smoky Mountain Living is all about home. That makes it the perfect place to talk about the homes of some of the creatures that share this marvelous landscape with us. Some animals that we know well don’t construct any kind of home. White-tailed deer like to bed down in thickets and/or brushy areas, usually near a source of water. While no kind of permanent shelter is maintained, as long as food is readily available whitetails, especially females (does) will live their entire life within a half-square-mile area. The whitetail’s larger cousin the elk, recently reintroduced to the Great Smoky Mountains National Park in Cataloochee Valley is adapted to the same type of al fresco existence. These large herbivores – cows often weigh around 600 pounds and bulls can reach 1,100 pounds – generally eschew the dense brambles preferred by whitetails and often band together on the forest floor where low-hanging limbs of conifers offer some protection from the elements. On the other hand, some creatures construct shelters so interesting and intricate that editors at Architectural Digest are left drooling on their keypads. Spiders immediately come to mind. Those gossamer strands, stronger than steel, finer than thread – a beautiful marriage of form and function, serve not only as an abode but also as a source of sustenance. And like all custom homes they come in an assortment of styles and sizes. That cool orb that radiates from the corner of your deck, holding dew drops in the sun, is probably the web that most people associate with spiders. 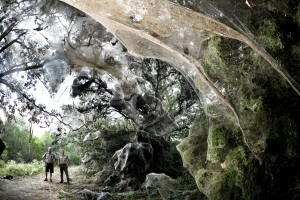 But there are funnel webs, tangle webs, tubular webs, dome webs and tent webs to name a few. The tiny Western Samoa spider spins a web of only 10 to 20 millimeters while the newly discovered Darwin’s bark spider of Madagascar weaves a web of up to 80 feet. And there are a few communal species that join together to build webs that might encompass several meters. 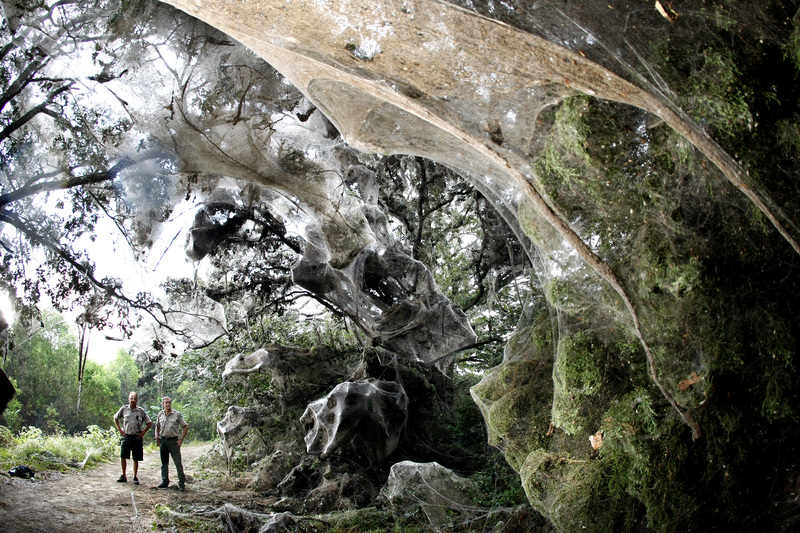 But the arachnid world was turned upside down in 2007 by the discovery of a massive web, nearly the size of two football fields along a trail at Lake Tawakoni State Park in Texas. Entomologists, at first, suspected some communal spider was responsible, but upon study discovered species from 12 different families of spiders had contributed to this colossal spider apartment complex. It appears the discovery of a pond laden with mosquito larvae and other insects spurred this innovative collaboration between species that are…”Normally…cannibalistic and their webs are separated,” according to Texas A&M University entomologist Allen Dean. Form and function are not, however, unique to only spiders. If it’s split-level living you pine for look no further than Castor canadensis, the American beaver. The rustic dome-shaped wooden exterior of the beaver’s lodge is designed and built by the residents themselves using only local beaver-selected, beaver-gnawed and paw-crafted limbs and branches cemented in place with the finest area mud. The wooden exterior is usually surrounded by water and the entrance is safely and conveniently tucked, out of sight, below the water’s surface. The beavers enter the lodge into a combination mud room (for drying) and pantry, where choice, local organic produce (limbs, etc) is stored for their dining pleasure. The next level up is the living area, where the colony (beavers mate for life and a colony generally consists of breeding pair, last year’s young and this year’s kits – babies) sleeps and lounges. There’s no way to feature the millions of unique animal homes in one magazine article. Fortunately the Smokies are home to a number of wonderful nature centers that showcase native flora and fauna. We went to three of them and let their experts tell us about some of their favorite animal homes and habitats across the region. Another of Bales feathered friends is the ovenbird, a small thrush-like, ground-dwelling warbler named for the type of nest it weaves from leaves and other dried vegetation. “Its name says it all, when finished, the nest looks like a little old-fashioned Dutch oven,” said Bales. But Bales favorite bird home is made from spider silk and lichen. According to Bales, the nest of the diminutive ruby-throated hummingbird “…looks like a tiny silk purse hanging from the fork of a branch high in a tree.” Bales said the ruby-throats are most often found at lower elevations near creeks with lots of nectar-producing flowers like jewelweed. We leave Ijams and Knoxville and cross over the mountains to 75 Gashes Creek Road, Asheville, Nc. and the Western North Carolina Nature Center. This award-winning wildlife park is home to more than 60 species of animals native to, or once native to the Smokies. While architects and builders are busy designing creature comforts into the homes they build, Jesse Paden, exhibits curator, at WNC Nature Center is busy planning for comfortable creatures. Paden says the center strives to make its exhibits as natural as possible for the animals. This is evident in the recent renovation and expansion of the river otter habitat. In the wild river otters establish burrows and/or dens near the water’s edge. There are usually several tunnels with at least one that allows the otter to enter and exit underwater. According to Paden, the WNC Nature Center’s renovated exhibit gives the otter pair (Olive and Obiwan) easy access between terrestrial and aquatic habitat. The expanded terrestrial habitat with different substrates of grass and soil allows the otters to roll around, dry, sun and groom themselves like they would in the wild. Because Olive and Obiwan are potentially a breeding couple, the nature center habitat allows for their separation, mimicking the way adult females move and den alone during breeding season in their natural habitat. The largest area at the WNC Nature Center is the Appalachian Predators exhibit. Here in separate, adjacent habitats mirroring the native forests where these animals now roam or previously roamed are red wolves, gray wolves, cougars, bobcats and coyotes. The red wolf was declared extinct in the wild in 1980. The WNC Nature Center is one of only 46 red wolf breeding sites in the country. It is an integral part of the red wolf captive breeding and reintroduction program. According to Paden the forested area where the red wolves are corresponds to the native forests they once inhabited throughout the Smokies. Paden also noted that the nature center provides water features as well as artificial dens modeled after the ones wolves would create in the wild. Paden noted that the WNC Nature Center is continuously upgrading and enhancing its exhibits. A new small mammal exhibit opened in 2009, containing red and gray foxes. In the wild, both of these animals utilize dens, both for rearing young and also as non-breeding resting sites. He said that plans were in place to create den sites for the foxes. Gray foxes do, indeed, utilize dens, probably even to a greater extent than red foxes but gray foxes are quite unique. They are excellent tree climbers and there are accounts of them using abandoned hawk nests for napping. The next stop on our parade of animal homes is Highlands, Nc. and the Highlands Biological Station which includes the Highlands Nature Center and Botanical Garden. The Highlands Nature Center is open from May through October. The Botanical Garden and its self-guided trails are open year round. The Biological Station is a year-round biological field station and an inner-institutional center of the University of North Carolina. Dr. James T. Costa is executive director of the Highlands Biological Station, professor of biology at Western Carolina University, entomologist, research associate in entomology at Harvard’s Museum of Comparative Zoology and author of The Other Insect Societies and The Annotated Origin – an annotated edition of the Origin of Species both published by Harvard University Press. Suffice it to say, Dr. Costa is passionate about bugs. And he knows a lot about how and where bugs live in the Smokies. We’ve all seen those strange looking bumps, knots, balls and/or cones on the stems and leaves of plants and wondered where they came from. Those growths are galls and according to Costa, “Lots of plant-feeding insects and their relatives are able to induce galls- abnormal plant growths that provide the insects with both food and shelter.” Costa said that the insect egg produces a chemical that mimics the plant growth hormone causing the plant to grow around the egg. The larva grows inside it’s new home which provides food and shelter. Costa notes that, “Gall-inducing insects are typically very specific with respect to the plant they feed on. Their galls, too, usually have very particular shapes, so that it’s possible to identify the species of insect just by the plant species and gall shape.” Ever see those little cones on witch hazel leaves that look like witches’ hats? Those, said Costa, are created by an aphid known as Hormaphis hammamelids. Ever wonder why so many of our black locust trees appear to be dying in the middle of the summer? It’s because the locust leaf miner, Odontota dorsalis, is munching down. Larval leaf miners are so tiny and flattened that they, “…can actually live between the upper and lower layers of a single thin leaf,” said Costa. A novel idea on a “flat” don’t you think? Other types of insects’ homes, according to Costa, include “leaf rolls and ties,” where insects roll and/or tie leaves together to create shelter; silk tents; log galleries, where “wood roaches” excavate tunnels in rotting logs; and, of course, hives, where social wasps and/or bees live together in colonies ranging in number from a dozen or so to many hundreds. And we hope that when you think of creating your dream home in the Smokies you think of all the furry, feathery, slinky, slimy, big and tiny creatures you share the landscape with and choose to be good neighbors.